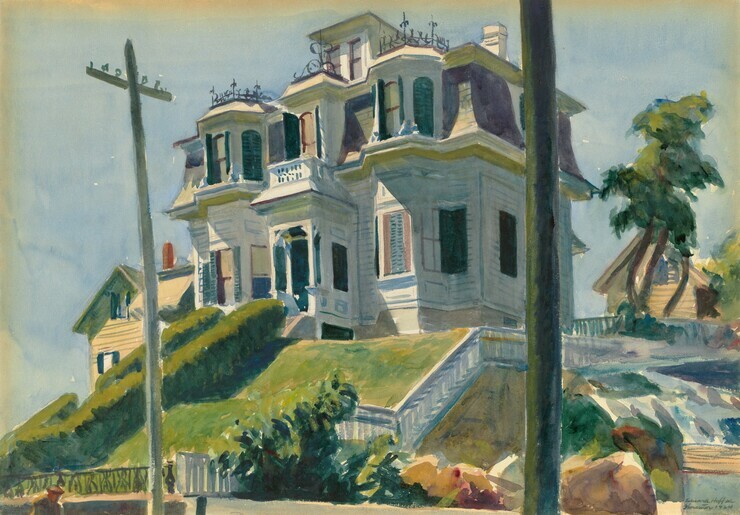 Hopper's earliest artistic success came by way of his watercolors and etchings, rather than the oil paintings for which he is now best known. Lacking buyers for his canvases, Hopper reluctantly worked as a commercial illustrator. 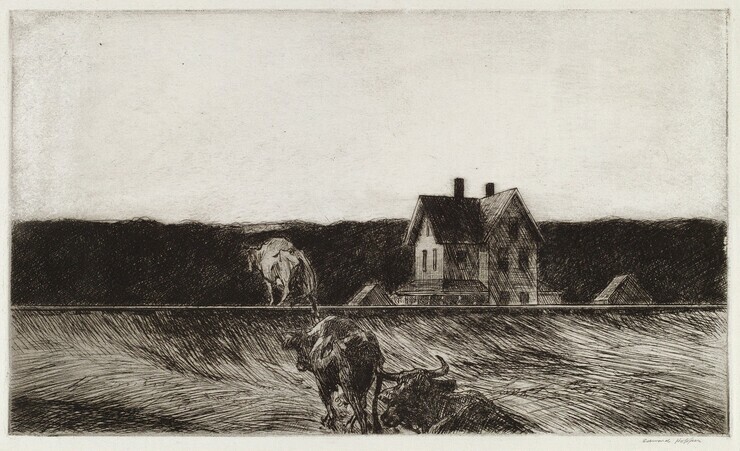 In 1915 he discovered etching, a medium that made economic sense (multiple prints could be sold of a single image) and also permitted the artistic freedom he craved. 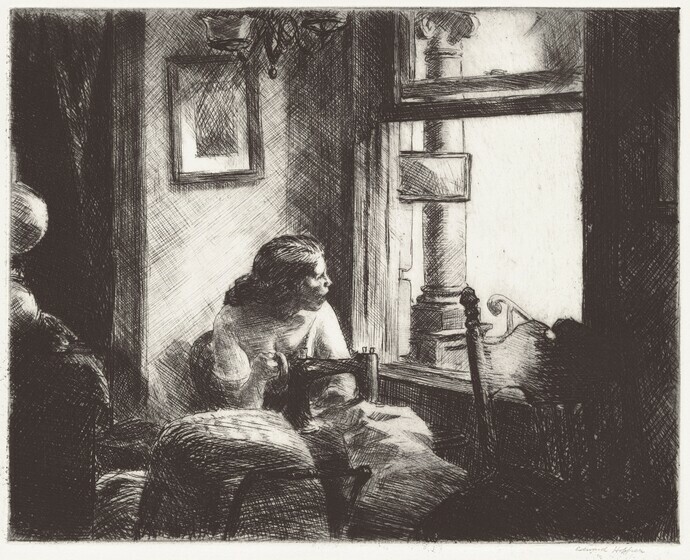 Hopper's etchings signal themes the artist would explore throughout his career: isolated figures, empty streets, strong contrasts between light and shadow, and the play of sunlight on architecture. Although Hopper's etchings are primarily drawn from urban subjects, he chose watercolor to depict his early small-town or rural images. Encouraged by his fellow art student and future wife Josephine (Jo) Nivison, Hopper began using watercolor in earnest when summering in Gloucester, Massachusetts, in the early 1920s. The portability of the medium allowed Hopper to paint outdoors, where he favored local architecture to the picturesque coastal scenes that had made the region a popular artists' colony. His depictions of New England garnered Hopper important recognition: in 1923 his first sale to a public institution (the Brooklyn Museum's purchase of The Mansard Roof) and in 1924 a solo exhibition at Frank Rehn's Fifth Avenue gallery that sold out quickly. Critics admired his deft handling of the medium, straightforward style, and ability to transform vernacular architecture into something beautiful. Self-Portrait, 1925-1930, oil on canvas, Whitney Museum of American Art, New York, Josephine N. Hopper Bequest © Heirs of Josephine N. Hopper, licensed by the Whitney Museum of American Art. Photograph by Robert E. Mates. Throughout his career, New England—first Gloucester, later Maine, and finally Cape Cod—was the source for much of Hopper's subject matter. These coastal communities were popular destinations for artists, but the independent-minded Hopper remained distant from his colleagues, dryly noting, "[W]hen everyone else would be painting ships and the waterfront, I'd just go around looking at houses." He had a penchant for architectural styles of past centuries, especially the Victorian with its heavy ornamentation and mansard roofs. He rendered these houses with dramatic light and often in isolation. Along the coast of Maine, where Hopper visited in the late 1920s, he painted lighthouses, solitary beacons amid the landscape. Full of intrigue and mystery, Hopper's lighthouses surpass their utilitarianism and assume a commanding presence—no longer mere incidental structures like those in the seascapes of other artists. Beginning in 1930, Hopper and Jo (who wed in 1924) spent summers on Cape Cod, where the couple eventually built a house and studio in the town of Truro. There, Hopper's style became more geometric, perhaps inspired by the architecture of the region's saltbox constructions. Always a realist painter, and critical of many modernist trends, Hopper nonetheless inched toward abstraction in these simplified compositions that experimented with the interplay of color, form, and light. For Hopper, however, architecture was never reducible to mere form—it always remained in dialogue with nature. As the artist plainly remarked later in his career, "What I wanted to do was to paint sunlight on the side of a house." Marshall's House, 1932, watercolor over graphite on paper, Wadsworth Atheneum Museum of Art, Hartford, Connecticut; Purchased through the Gift of Henry and Walter Keney © Wadsworth Atheneum Museum of Art. Although Hopper regularly visited New England, Greenwich Village (where he lived in the same apartment from 1913 until his death in 1967) was home, and New York set the stage for many of his most iconic paintings. Just as he in New England shunned dominant artistic motifs, Hopper disregarded many Jazz Age subjects—soaring skyscrapers, bustling streets, and industrial machinery—favored by American modernists. Indeed, Hopper's New York is at once instantly recognizable and strangely unfamiliar: streets are devoid of pedestrians, stores are without customers, and even automats—modern restaurants in which coin-operated, food-dispensing machines replaced waiters—lack signs of anything automatic. And though New York architecture rose to great new heights, Hopper favored instead a horizontal compositional format more closely linked to landscape traditions. He also avoided signs of the grit, noise, and commotion of urban life, imbuing his portrayals of the city with an overwhelming silence and disquieting stillness. From Williamsburg Bridge [Williamsburg Bridge], 1928, oil on canvas, Lent by The Metropolitan Museum of Art, George A. Hearn Fund, 1937 Photograph © 1989 The Metropolitan Museum of Art. Early Sunday Morning, 1930, oil on canvas, Whitney Museum of American Art, New York, Purchase, with funds from Gertrude Vanderbilt Whitney Photograph by Steven Sloman. Emptiness and silence pervade Hopper's scenes. New Yorkers find themselves alone in the supposed privacy of their homes and hotel rooms, but also in the public realm of restaurants, lobbies, theaters, and the street. In New England, houses and lighthouses stand secluded on hillsides or along the coast. In Gas, a scene from Truro, a lone attendant adjusts the nozzle at a deserted rural filling station. The lanky figure (not unlike that of the artist) echoes the form of each pump, whose progression in the center of the canvas leads the viewer down the empty country road. In other works, the presence of additional figures—a fellow diner, traveller, colleague, or spouse—only renders the isolation more acute by unfulfilled promises of true companionship. Hopper's paintings invite endless interpretation; they have been variously described as representations of loneliness, alienation, melancholy, or solitude. Hopper, however, cast doubt on such readings, noting, "the loneliness thing is overdone." Over the years when prompted, he offered several explanations for his paintings, often defining them in personal terms: "Great art," he wrote, "is the outward expression of an inner life in the artist, and this inner life will result in his personal vision of the world." Automat, 1927, oil on canvas, Des Moines Art Center Permanent Collections; Purchased with funds from the Edmundson Art Foundation, Inc. Des Moines Art Center Permanent Collections. Photograph by Michael Tropea, Chicago. Room in Brooklyn, 1932, oil on canvas, Museum of Fine Arts, Boston, The Hayden Collection © Museum of Fine Arts, Boston. Throughout his career, Hopper was fascinated by dramatic lighting and nowhere is this more evident than in his nighttime pictures, where brightly lit interiors contrast with the darkness outside. Glowing fluorescent or electrical lights, which illuminate windows and spill onto otherwise darkened street, set the tone for many of Hopper's paintings and imbue the works with an air of mystery. The voyeuristic possibilities inherent in the modern city, where people lived in close proximity but often with anonymity—are especially apparent at night. Hopper frequently depicted stolen glances from fast-moving elevated trains and glimpses from windows into neighboring buildings, where figures are busy with their own private concerns, unaware or unconcerned that they are being watched. Drug Store, 1927, oil on canvas, Museum of Fine Arts, Boston, Bequest of John T. Spaulding © Museum of Fine Arts, Boston. House at Dusk, 1935, oil on canvas, Virginia Museum of Fine Arts, Richmond, The John Barton Payne Fund © Virginia Museum of Fine Arts Photograph by Katherine Wetzel. Nighthawks, 1942, oil on canvas, The Art Institute of Chicago, Friends of American Art Collection, 1942.51 Reproduction, The Art Institute of Chicago. Photograph by Robert Hashimoto.